When I learned that the 8" square I knit for a community afghan was lonely, I was not sure what to do. Then I remembered a long-abandoned crochet project someone gave me several months ago. I told the organizer I would examine the contents of the hibernating piece and see if it might be something that would work. Let us fast-forward through the weaving in of many ends, gauge issues, seaming, and steaming. That brings us to the finished piece. Did anyone else lose a day or three this week? It was not necessarily a bad week, but I just missed most of it. Still, I have been productive. I finished some yarn that I started long ago. 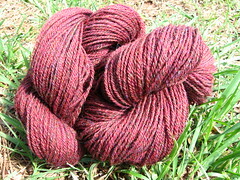 It is a three-ply yarn from mystery wool top in the Indian Summer colorway from Little Barn. I think it is somewhere around 310 yards. I do not know what it will become. Finishing this yarn makes me excited to spin the next yarn. It is time to explore the fiber stash. I like Sock Madness. First, of all, there are the organizers. There would be no Sock Madness without them. They put in so much time and effort into the experience. They set the tone for the positive experience that keeps players coming back, and the cheerleading going. They have worked throughout the year with designers and test knitters so that we can play once again. Thank you, Hillary, and Carole! Then, there are the patterns. Each year, I learn at least one new technique, construction, or other helpful bit. It is a different experience for me to knit a pattern exactly as written, but that is how this game is played. Exposure to designs I might not have chosen on my own has also introduced me to different designers and different ways of knitting socks. Learning is always good. Finally, there are the players. They keep the excitement and camaraderie going from the weeks leading up to the event, all the way through the last pair of knitters competing. They take time to post a helpful link or tutorial. They are quick to answer questions for new players, and warmly welcome the seasoned veterans of this game. They treat this competition with all the seriousness it deserves, and celebrate it with all the silliness that it is. I made my way through Round 1 of SM3. 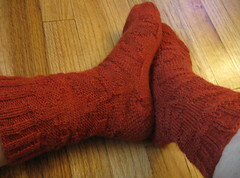 I took advantage of the slower pace of the first round, and knit this pair more slowly. It feels like others have also chosen a more relaxed beginning to the game. The pattern was inspired by the Drunkard's Path quilt block. It does not want to show up very well in my pictures, but it was an interesting knit. I am a short-row heel kind of gal, but if I am going to knit a heel flap, it might as well be one with "Eye of Fauxtridge." I truly thought I would have finished these this past Saturday, or Sunday, at the latest. Instead, I was done this evening. My first package from my psc was good. I have always liked looking at this pattern, and admired the fancy stockings. Now I have my own pair, and I think they are even fancier than those in the book are. I continued the lacy ribbing down the back of the leg, decreasing the plain stitches between the lace repeats. I also exchanged the heel flap for a short-row, y-heel. I have already worn one of the socks. I was cold last night as I knit the second one. I was also fixing my sister's computer. Tired as I was, I could not sleep for anything. I wrapped myself in two shawls and worked away. Bruce laughed when he saw me. I was a bit of a sight. I wish the situation had been more conducive to other knitting, but was quite glad for the sock to keep me company. Also, I needed to clear the needles. SM3 starts in the morning. Knitting the Shetland Tea Shawl has been wonderful. Even though the rounds became quite long, I loved knitting every stitch. I only ever retrieved one ball of yarn at a time. When I needed more yarn, I went to the closet, opened the tub, and pulled out another. I Russian joined the new to the old. The spent ball bands went to the bottom of the knitting bag, or into books to mark pages. After much knitting, I finally reached the end of the last chart. It was also time for more yarn, so I repeated the same actions. I did not think of how many times I had done this during the knitting of this lace. What I can tell you is that I cannot do it another time. There is no more. I was sure there was more. I should take that back, because I could not tell you how many balls of yarn I thought I had. What I thought is that I had enough to knit this. It would seem that I was wrong. I went through the stash. Had I not once swatched with some of this yarn a few years ago? Surely there were one or two more in there. They had just been taken out and never found their way back the proper bin, right? Somehow, I must have made a miscalculation. This mistake has me somewhere between wanting to scream, wanting to cry, and feeling so very stupid. I am trying to obtain more of the yarn, and remain hopeful. 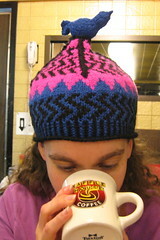 I plan to keep knitting the Beechleaf Edging. Knitting one hundred fifteen chart repeats is bound to keep me busy. Perhaps by the time I reach the end of the ball, I will have more yarn. That should also let me know just how much more yarn I need. I should also be able to knit that chart in my sleep by then. My energy levels have been a bit on the low side. In fact, yesterday, I fell asleep on my mom's couch amidst the noise of an energetic preschooler. My ear had been bothering me for about a week, so when I was in for a check up, I mentioned it to the doctor. "Ooh, that is very red; that looks very bad," were the doctor's comments after examination. I hope that explains everything, and that I will be back on my game soon. When I am not slumped over or passed out, I am knitting. The March socks are coming along nicely. The Shetland Tea Shawl is a quite warm. That was wonderful when it snowed. Since it is over 80 degrees in the house right now, I am finding it less enjoyable to knit. I will want to make the most of the time I feel like knitting it so that I may finish soon. I am done with the body, and am ready to begin the edging. It is already so pretty, and I can only imagine how much nicer it will be after blocking. I have also been easing my way into a more structured exercise program, and it has helped my back. I have been using the inversion table more, and have worked back to full inversion. It is uncomfortable around the heel and instep, but I am hanging in there. Oh, yes, I am hilarious. I wish I knew if the gravity boots/conversion bar kit would help. It would be a pricey investment, but one I would make in a heartbeat if I knew it would help. There was a dare for me to knit and wear this hat. I decided to accept, and am glad I did. I love my new hat! Having it has made the brief return of colder weather welcome. The shadow I cast is pure entertainment. I am wearing the hat at every opportunity. At the birthday party, people suggested one of these hats would be perfect for someone else. I wore it to the Waffle House in the middle of the night. The waitress was puzzled, but told me she liked it. My headwear for the first Monday after Thanksgiving is ready. I reached up amongst the brown paper sacks, and pulled down the selection for March. Nestled between the perfectly pine green yarn was a slip of paper. I will be knitting a Nancy Bush pattern from her 2001 release, Knitting on the Road! Yes, for the psc, I am knitting a nearly decade old pattern with the readily available Knit Picks Essential sock yarn, and I have never felt less exclusive. I love it! I can only hope I love knitting my New England socks as much. It will be nice to have a more portable project. Sometimes I am just not up for a 574-stitch round. They will also help to satisfy my yearning for new lace. Still, socks are not a shawl. I think I know what the next lace will be, and I am OK to wait for it. 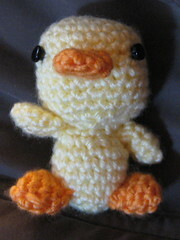 For today's photo offering, I give you a poor snapshot of the latest amigurumi. This went to my niece at the birthday party yesterday. It went over well, as did the ninja for her brother. Tomorrow will have a more entertaining picture.